Shawn Fogel will once again be bringing two projects to the same stage: the sparkling power pop of Golden Bloom and the fun audience-uniter, Neutral Uke Hotel. Both bands will play a showcase at The Cameo Gallery on October 21st as part of CMJ’s Music Marathon and Film Festival which takes over New York from October 19th through October 23rd. Robbers on High Street and Pearl and the Beard will also play. This year’s festival features hundreds of musical acts including: Phoenix, Surfer Blood, Two Door Cinema Club, School of Seven Bells, Justin Townes Earle, Black Label Society, Four Tet, The Drums, and many more. 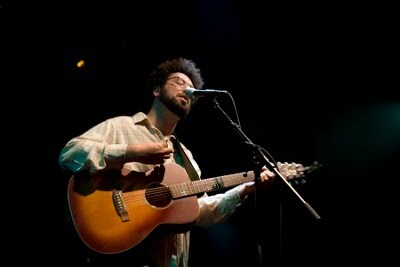 Golden Bloom is Shawn Fogel’s soaring vocals, shimmering guitar hooks; whizzing keyboards and twinkling sounds. In fact, Golden Bloom is all Shawn Fogel, at least for the purposes of recording. The CMJ showcase will feature one of the many configurations of musicians that is the live line-up of Golden Bloom. The band has been rapidly adding to the impressive list of bands he’s played with recently. They’ve done shows with Someone Still Loves You Boris Yeltsin, Hey Marseilles, Telekinesis and Sea Wolf in the past few months. Fogel is back in the studio with Peter Katis (Frightened Rabbit, The National, Interpol and Tokyo Police Club), to produce some tracks on the follow up to Fan the Flames, which was compared favorably to Summerteeth-era Wilco, The New Pornographers, and Big Star and loved by critics and fans alike. He’s has also been busy with Neutral Uke Hotel, a side project that has been taking the world by storm with live performances of Neutral Milk Hotel’s In the Aeroplane Over The Sea which is played entirely on ukulele. Celebrating its 30th year, CMJ Music Marathon & Film Festival is headquartered this year at New York University’s Greenwich Village campus and dozens of downtown Manhattan and Brooklyn venues. CMJ, New York City’s largest music festival, brings together more than 120,000 music fans, music business professionals, college radio tastemakers, press, artists, filmmakers, and industry icons. Artists from more than 30 international territories are expected to partake in CMJ Music Marathon 2010, from Australia to Japan and everywhere in between.